I have officially worked myself out of a job. Elias, our 10 year old, has now been declared our Chief Pizza Maker. Why? Because I’ve figured out how to make quick and easy pizza crust – and I’ve figured out that this pizza crust freezes really, really well. Therefore, I make a double batch of pizza dough, shape it, and bake it into personal sized crusts – and then I freeze them. On “pizza day”, Elias gets out the crusts and toppings, and puts together “made to order” pizzas for everyone. He then bakes them in our toaster oven, all while I am sitting with my feet up in an easy chair, sipping lemonade, and flipping through a magazine. Just kidding. I’m typically working right beside him on another kitchen chore. But it sure is nice to have a my big guys around who help so much. And it’s so very nice to have such an easy recipe to work with so that making pizzas is crazy easy. Mix all ingredients together, knead for 3-4 minutes, then allow the dough to “rest” for about 10 minutes (give or take). This dough makes 2 large pizzas, or 18 mini pizzas. 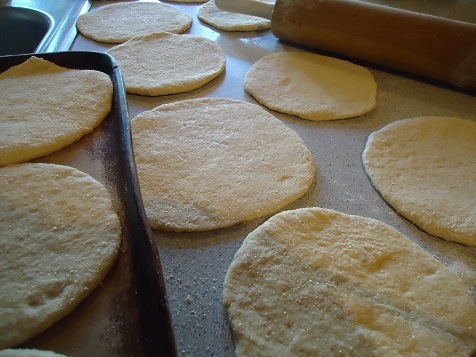 Remove crusts from oven, allow them to cool, then freeze in freezer bags. Or, top hot pizza crusts with desired pizza toppings. When you're ready, bake the pizzas at 375° for 10 minutes or until cheese is bubbly and beginning to brown. FYI – I find that 2 cups (16 ounces) of pizza sauce is typically needed to go with this pizza crust recipe. I love how easy this dough is to work with. 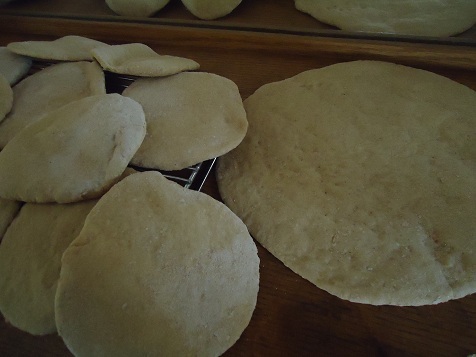 I simply pinch off a little dough, and quickly roll out crusts and bake them. Once they have baked and cooled, I put them into freezer bags. I don’t even get them out in time to thaw before we top them and bake them. So convenient! Ever tried freezing pizza crusts? If not, I highly recommend it. It makes homemade pizza so very easy! My pizza cooks all grew up! Every Sat night they put together pizza from dough that I made. Miss those days. I have some of that mini pepperoni in my freezer from a recent sale. It is waiting for the grandchildren’s next visit! So fun for them! Can he come over today? How do you freeze them? Foil, freezer bags? You must have been reading my mind. Over the last week I have been looking at pizza crust recipes, wondering which would be good for freezing. My boys love pizza and it is often a request when they have friends over at meal time. It would be so nice to have these in the freezer to pull out for a quick lunch or dinner. Thanks for doing the work to figure it out for me and sharing it. You’re the best! My husband loves when we have prebaked crusts in the freezer and just reminded me we are out. I like to add a bit of cornmeal for texture and garlic & onion powder for more flavor. Laura – Do you not let this dough rise at all? Only rest and then shape? Just checking. Nope, no rising necessary. It’s quick and easy! I made this dough when you posted about calzones and it is lovely! I never did roll them in to pizza crusts because I had some others in the freezer from another recipe I have made that my kids like (it’s more herbed and a bit more like Boboli). 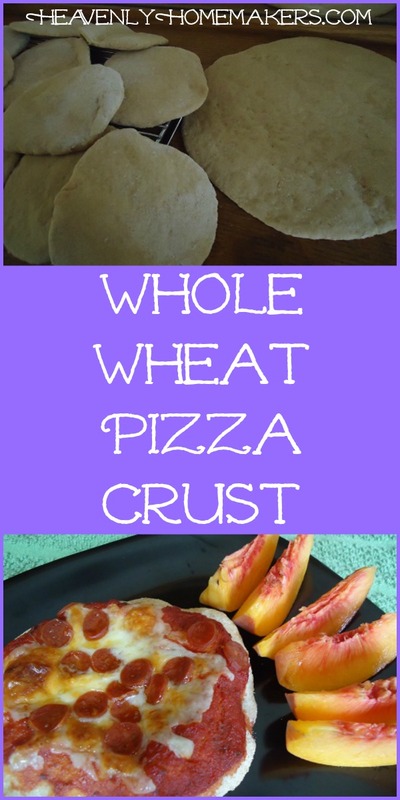 But I’m going to make these this week — I really like the whole wheat healthiness aspect and the calzone dough was so easy to work with (and believe me, I am dough-challenged). I made it in my bread machine, which takes some of the kneading and rising guesswork out of it (which is good for me). Excellent recipe! Wish I had access to freshly ground flour! Hi, I was wondering, if we are using store bought flour, which would be closer to your home ground, whole wheat or white wheat pastry flour? Thanks! Since this recipe calls for yeast, you would need to use regular whole wheat. Pastry flour only works for non-yeast recipes. If you can get your hands on whole wheat flour made from white wheat (instead of red) you will probably enjoy the flavor more. Learn something new everyday…I had NO idea pastry flour doesn’t work with yeast. Oh my goodness!! This is fabulous! Thank you, thank you, Laura! I will be doing this-what a fun, easy lunch/dinner idea! I do freeze pizzas for my teen. I par-bake the crusts, top them and freeze them individually for him in baggies. Then he just bakes them when he’s hungry for a snack. I will have to try this crust. I have also used bbq sauce and chicken for something different. Freezes well too! Just wondering if you need to poke the crusts with a fork before pre-baking? My dough always bubbles up if I forget to poke holes in it. Thanks for the idea of personal pizzas that way everyone can get their own the way they want it. I never do, and I’ve never had much problem with them bubbling up. But I think that’s probably a good idea to prevent it just in case! Thanks for the pizza crust recipe. I can’t wait to make it! And will my crew love to make their own pizzas. It will be a great start to a family fun night! I can’t wait to try this!! I Tried something a few years ago that is a little strange but really good, I do half water and the other half beer… all the alcohol is cooked off and the taste is very different… just a tad more tangy. I just love your site.. you and I were supposed to be really good friends.. we do a lot of the same stuff. Have a great week! Laura, it’s so wonderful to see your love and hard work coming through your son. What a blessing you are receiving, because you have “stuck to it” as Mother. Thanks for sharing this idea. I prepared your pita recipe the other day. Everything was great, but I rolled them to thin. I’m going to triple the recipe and then I won’t roll them to thin! My crust recipe calls for oil and honey but I will have to switch to this one. Fewer ingredients and freezes well is awesome. one can diced tomatoes, one can tomato paste, 1 tsp each of basil and oregano (or 2 tsp of italian seasoning), 1 tsp sucanat, 1/4 tsp red pepper flakes. May add 1 tsp of minced garlic and 1/2 tsp balsamic vinegar. Blend to your liking. When you make the mini’s up what size ball would you say the dough is before you roll it out? Golf ball, baseball???? I’d say golf ball size is perfect! Used this recipe to make cinnamon rolls this morning. I added 1 tablespoon of sugar, mixed, kneaded, etc. Turned out great!!! Thanks so much for this recipe! I made chicken alfredo pizza last night for dinner and used this crust! It was great! It was also the first time I have baked with whole wheat and the first time in almost 3 years to bake with a flour containing gluten!! What a treat it was to actually roll out a pizza dough!! It is the little things in life, right? Thanks again!! Can you freeze the dough or should you roll it out and bake it some before freezing? I’ve never frozen the dough before rolling and baking it, but I would imagine it would work. Thanks for the great looking recipe! We are slowly adding wheat back into our lives and I miss pizza the most. What brand were the turkey pepperonis that you bought? 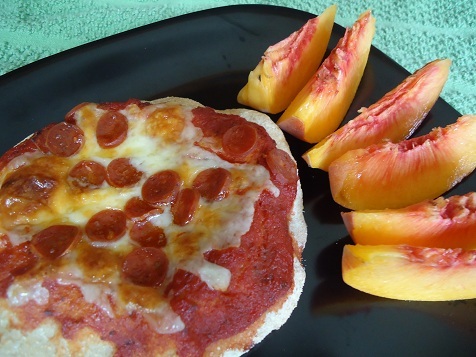 Pepperoni is something else I miss since moving to a Whole Foods diet. I miss the days when my son would cook with me. He loved making his own spice blends. He is only 12 but has found other interests, but making pizza always bring him in the kitchen with me. There is nothing better than cooking with the kids. When I make whole wheat bread I make a TON of it and make it into 2 gigantic 13″ loaves, rolls, pizza crust, cinnamon rolls, and crescent rolls. The bread recipe can also be used for bread sticks, hamburger buns and hotdog buns. It’s just a regular honey whole wheat bread recipe. I usually do the bread first so it has time to rise and then the other stuff according to what my hubbie wants. I know that Laura just pulls off some dough and works it but I find that there are some things that do better when weighed. Bread is one of those. If you weigh it you will always get consistent results and your bread will always fit in your bread bag. hamburger buns are also important to have the same because you don’t want too much bread to burger. 4 oz rolls are perfect for my family. Try something that works for you. Everything else just wing it. this one has a lot less fat! I made this last night and it came out super dense and too chewy. Couldn’t cut through it with a knife almost. What did I do wrong? I can’t say for sure, but it sounds like your yeast didn’t activate correctly. It could be that the water was too hot and killed it? Hope it works better next time! I have a recipe that is almost exactly the same as this one except it uses 1/4 cup oil. Any idea what the oil does? Love this idea – it seems like our crusts turn out doughy sometimes. You can use oil. Laura prefers hers without. I have heard it makes it chewier with the oil. Just wondering if sea salt is a must or is regular iodized salt okay too? Go for it – this should work fine! I love your ideas. I just recently found your blog and love reading it. We have a lot in common with the way you keep your kitchen, pantry etc. I like to cook based on buying in quantity and instead of menu planning I cook what needs used the most/what I have on hand. This is easy to do knowing we cycle thru a lot of the same meals. We also have our venison from my hunters and beef from a friends cattle farm so I always have meat in the freezer. I keep meal items in stock like turkey pepperoni, pizza toppings etc. We have quite eating out for the most part, but we buy frozen pizzas for Sunday nights. Although, my family loves my homemade pizza I stopped making it so that I could rest on Sundays. I am so excited to use your pizza dough in the freezer idea so that I can have the best of both worlds!!! THANK YOU! I don’t have all boys, but I have 5 children(2boys) and married daughter, son-in-law, grandbaby to feed. So I love the short cuts to better eating that you give! I just made this using ww pastry flour and then read the comments about it not working with pastry flour but mine turned out fine. It is good ???? Sorry I didn’t mean to put question marks. made this for dinner tonight and made an extra batch for freezing and it was a hit! I had made an extra batch for freezing, but the 2 large crusts are too large for any freezer bag I have (gallon is the largest). Wondering how you package those? Or do you only freeze your minis? I typically just freeze my mini sized pizza crusts. But you can find two-gallon freezer bags at the store that I have used before for larger pizza crusts. I am planning on making your pizza dough today to be served tomorrow. Do I still freeze it? Or should I just refrigerate it? When I place the toppings on it? You can definitely just make the pizza dough and serve it at any time without freezing it! I always top it after it’s baked for 4-5 minutes, or right before baking and serving. My husband loves pizza, and orders out every other night or pops a freezer pizza in the oven because its easy. He works days, I work nights, with our crazy schedules Im trying to prep our meals so we can make healthier choices, this would work perfect!! I was wondering if I could freeze it with the sauce, cheese and toppings as well?? It’s worth a try, although I have a hard time getting the toppings to stay on and prefer to have meat, cheese, and veggies prepared, ready to throw on before baking. BTY, for those who have a Fresh and Easy in your area, they have MSG and nitrate free pepperoni. I’m guessing Sprouts does, too, although I haven’t looked there. How could I soak this recipe? Any ideas? I’d like to know also. Unsoaked grains are a no-no. Do you thnik this would work with sprouted flour ? I’d like to borrow your ten year old. Is that offer still good? My eleven year old and twelve year old seem to be malfunctioning. On a more serious note, this is my favorite pizza crust recipe. I have tried many and have not settled upon one that I really like until now. Thank you! I made one big rectangle turkey pizza last night and divided up the other half to make 4 personal pizzas later. I just finished mixing and now its resting. Is the dough supposed to be thick and stiff or soft and elastic? Mine was so hard. Maybe I need more water? Oh well I guess I’ll finish it and see how it turns out. Any suggestions? It shouldn’t be too stiff. I would add more water next time or less flour. I am making a batch of this now. :) Thanks for sharing! Made a double batch of this today but ran out of time and had to refrigerate the dough. When I finally got back to it, it had over-risen and fallen completely flat. So I stared at all that fresh ground flour gone to waste and couldn’t just throw it away. So I rolled it really thin (lots of hard work–you have to flip the dough over after every stroke of the rolling pin) and brushed it with olive oil and sprinkled on my favorite pizza herbs. Poked holes and made six “cracker bread” pizza crusts and a lot of other crackers (some just salt, and some rosemary and garlic.) It was worth the extra work, and I still have pizza crusts for when we need them. Can you use a kitchenaid with dough hook for this recipe? Or do you really need to hand knead it? Thanks! You can definitely use a kitchenaid! Any idea how mms any calories in the mini crusts? What should the texture of the dough be like? Mine feels quite dense and heavy. I am using hard white winter wheat. Is there a difference between hard white wheat and hard white winter wheat? Thank you! Laura uses hard white wheat as well so I am not sure why it would be too chewy. Maybe your yeast did not activate correctly to give it that fluffier texture? One thing you can try is to use less flour as well. Sometimes that helps with the texture being less dense. has anyone substituted almond flour for whole wheat. I am diabetic and nees to conserve carbs?